From Colombo take Southern Highway to Matara and come to Hambanthota Town.Then come to Katuwewa Junction and turn left. 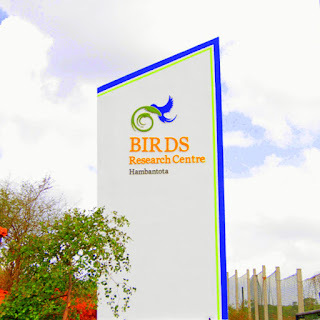 7km From Katuwewa junction you will find our Birds Research Center & Resort. Please follow the sign boards.20 minutes from Mattala Airport. Will envisaged to establish a Bird Research and Breeding Center in Hambanthota with aviaries to house various exotic bird species with supporting faculties for breeding and research. The center will provide limited exhibition facilities for general public. The Centre which has been established for the reproduction of rare birds and those which are threatened with extinction spans 38 acres. The Centre has a collection of all varieties of worldwide birds.The Centre is also equipped with all facilities necessary to undertake studies on special varieties of birds. Newly built convention center can accommodate international conferences and events organized by the bird park supported by new resort hotels in the area. Tourists, school children of Sri Lanka and their parents can visit the center as a part of Hambanthota city tour and this will defiantly add to the list of many attractions in the area like the port, Airport, cricket stadium, Rekawa turtle breeding center, Hummanya, Martello tower and many more land mark buildings that are proposed to come up. The center will create awareness and interest in wild life and the Importance of Conservation of fauna and flora.